The defending Super Bowl champion Eagles (8-7) need a win at Washington (7-8) next week and for Minnesota (8-6-1) to lose at home to Chicago (11-4) to get a wild-card berth. The Texans (10-5) missed an opportunity to clinch the AFC South and also allowed New England (10-5) to take control of the No. 2 seed. But when Pittsburgh lost to New Orleans, Houston earned at least a wild-card berth. The Texans would secure the division title with a victory against Jacksonville next week. They'd get a first-round bye with a win and if the Patriots lose or tie. 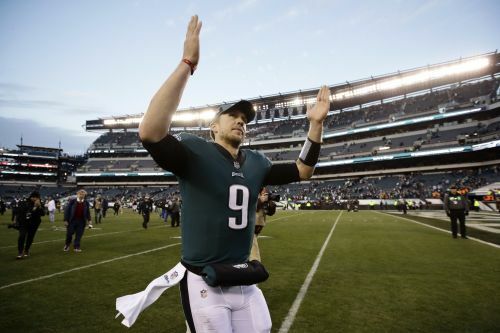 Filling in for the injured Carson Wentz for the second straight week, Nick Foles again played like the Super Bowl MVP who led Philadelphia to a victory over New England. Foles threw for a franchise-record 471 yards and four touchdowns. Deshaun Watson had two TD passes and ran for two scores for Houston. Watson threw a 35-yard touchdown pass to Vyncint Smith with 2:04 remaining as Houston rallied from a 13-point deficit. But Foles brought Philadelphia back into position for the win. Foles was injured on a late hit by Jadeveon Clowney while completing a 19-yard pass to Alshon Jeffery to the Texans 30 on third-and-10. Nate Sudfeld came in and threw an incomplete pass, but Foles returned on the next play. His 20-yard pass to Zach Ertz on third-and-10 put Philadelphia at the Houston 35. The Eagles ran the clock down and Elliott made the kick to make up for missing an extra point in the quarter. NEW ORLEANS (AP) — Drew Brees capped a 326-yard passing performance with a 2-yard touchdown to Michael Thomas with 1:25 left, and the Saints clinched the top seed in the NFC playoffs. Alvin Kamara gained 105 yards from scrimmage and ran for two touchdowns for New Orleans (13-2), which rallied for the lead after two defensive stops in the fourth quarter. New Orleans ended one Steelers drive when Kurt Coleman forced Stevan Ridley's fumble, and ended another by narrowly thwarting a fake punt. Pittsburgh drove into field-goal range on its final drive, but JuJu Schuster fumbled when he was stripped by defensive lineman Sheldon Rankins as the receiver landed on top of his tackler. Linebacker Demario Davis recovered. FOXBOROUGH, Mass. (AP) — The Patriots earned their 10th straight AFC East title with Sony Michel running for 116 yards and a touchdown. New England (10-5) improved to 7-0 at home this season and became the first franchise in NFL history to earn playoff berths in 10 straight seasons. It also marked the Patriots' fifth straight win over the Bills and their 26th series sweep of Buffalo (5-10). Brady went 13 of 24 for 126 yards, a touchdown and two interceptions — his lowest output since he passed for 123 yards in a 2003 loss to the Bills. But with the touchdown he joined Peyton Manning, Drew Brees and Philip Rivers with at least 10 seasons of 4,000-plus passing yards. Manning has 14 such seasons, Brees entered the day with 12 and Rivers has 10. ARLINGTON, Texas (AP) — The Cowboys wrapped up the NFC East title when Dak Prescott accounted for two touchdowns and Jaylon Smith returned a fumble 69 yards for a score. SEATTLE (AP) — Russell Wilson threw a 2-yard pass to Ed Dickson with 7:31 left for his third touchdown strike, Chris Carson rushed for two scores, and Seattle beat Kansas City to clinch an NFC wild-card berth. Wilson got the better of Kansas City's Patrick Mahomes and helped lead Seattle back to the postseason after missing the playoffs a year ago. Seattle's has made the playoffs in seven of the nine seasons with Pete Carroll in charge, and six of seven with Wilson at quarterback. GLENDALE, Ariz. (AP) — C.J. Anderson, playing five days after he was signed by Los Angeles, rushed for 167 yards — one shy of his career high. Anderson, playing in place of the injured Todd Gurley, had a 4-yard touchdown run and other runs of 46 and 27 yards as the Rams (12-3) rushed for 269 yards, most allowed by Arizona on the ground this season. With the victory, Los Angeles held on to the second-best record in the NFC with one game to go. Arizona's Larry Fitzgerald, in perhaps his final home game, threw the first touchdown pass of his career, a 32-yard toss to David Johnson. But it was the only trip to the end zone for the Cardinals (3-12), who at 1-7 had the worst record home since they moved to Arizona in 1988. A loss in their season finale at Seattle would leave them 3-13, matching the worst record since that move from St. Louis. INDIANAPOLIS (AP) — Andrew Luck hooked up with Chester Rogers for a 1-yard TD pass with 55 seconds left to give the Colts their only lead of the game. Indy (9-6) has won eight of nine to keep itself in the playoff hunt heading into the regular-season finale at Tennessee. The Colts, who won their last six home games after starting 0-2, would win the AFC South with a victory over the Titans and a loss by the Houston Texans. Indianapolis would also earn a wild card if it beats Tennessee and Baltimore loses. The Giants (5-10) lost their second straight — on a day they committed too many late miscues. After driving to the Colts' 7-yard line early in the fourth quarter, New York wound up settling for a 27-yard field goal that kept it a one-possession game at 27-21. On the final drive, linebacker Tae Davis was called for pass interference on third-and-3 and cornerback B.W. Webb was called for it in the end zone. Eventually, Luck made the Giants pay with the easy score to Rogers. DETROIT (AP) — Kirk Cousins threw a 44-yard Hail Mary to Kyle Rudolph as time expired in the first half to put the Vikings ahead, moving a step closer to playing in the postseason. Minnesota (8-6-1) can still earn a spot in the postseason by closing the regular season with a win against NFC North winner Chicago at home, or by having wild-card hopefuls lose in Week 17. The Vikings overcame an awful start offensively, scoring two touchdowns on Cousins' passes over the last 1:32 of the second quarter, and relied on their defense all afternoon against Detroit (5-10). SANTA CLARA, Calif. (AP) — Mitchell Trubisky threw one touchdown pass, Jordan Howard ran for another score and the Bears survived a fight and a late fumble to earn their eighth win in nine games. Danny Trevathan made a key interception in the fourth quarter and Chicago's stout defense kept the 49ers out of the end zone to clinch at least the third seed in the NFC playoffs. The Bears (11-4) can earn a first-round bye with a win in the season finale and a loss by the Rams. Robbie Gould kicked three field goals for the 49ers (4-11), who had their two-game winning streak snapped. The game turned feisty in the fourth quarter, when San Francisco safety Marcell Harris hit Trubisky after he started sliding on a scramble near the Bears bench. Trubisky's teammates took exception to the hit and a scuffle ensued with punches being thrown. San Francisco cornerback Richard Sherman and Chicago receivers Joshua Bellamy and Anthony Miller all got ejected. MIAMI GARDENS, Fla. (AP) — Blake Bortles came off the bench late in the third quarter with the score tied and provided a spark, helping the Jaguars eliminate the Dolphins from the AFC playoff race. Bortles took the Jaguars 51 yards for a short field goal and 10-7 lead early in the fourth quarter. On the next series, Telvin Smith Sr. intercepted Ryan Tannehill's pass and scored on a 33-yard return. The Dolphins (7-8) will sit out the playoffs for the 15th time in the past 17 years, and they'll finish at .500 or worse for the ninth time in the past 10 seasons. The Jaguars (5-10) won for only the second time in the past 11 games. CLEVELAND (AP) — Baker Mayfield threw three touchdown passes to thrill a sellout, holiday-spirited crowd that came out to boo former Cleveland coach Hue Jackson. Mayfield continued his stellar rookie season, one that took off after Jackson was fired by the Browns on Oct. 29. Mayfield's 24 TD passes are the third most in NFL history by a rookie, trailing only Peyton Manning and Russell Wilson, who both had 26. With their fifth win in six games, the Browns (7-7-1) improved to 5-2 under interim coach Gregg Williams, who has gone from long shot to legitimate candidate to become Cleveland's next coach. It's only the second time since 2007 the Browns have won at least seven games. However, Mayfield connected with tight end David Njoku for 66 yards and the Browns ran out the clock. Following the long play, Mayfield jogged backward and stared in the direction of Cincinnati's bench and presumably at Jackson, whom he called "fake" following their matchup last month in Cincinnati. EAST RUTHERFORD, N.J. (AP) — Aaron Rodgers threw a 16-yard touchdown pass to Davante Adams with 6:23 left in overtime. The victory was the Packers' first on the road this season — snapping a nine-game skid away from Lambeau Field dating to last season — and it prevented them from becoming the first Green Bay squad since 1958 to go an entire season without a win away from home. CHARLOTTE, N.C. (AP) — Matt Ryan threw for 239 yards and three touchdowns, and the Falcons handed the Panthers their seventh straight loss. Ryan found Calvin Ridley for a 75-yard touchdown strike on the first play of the second half for the go-ahead score. He also connected with Mohamed Sanu on a crossing route for a 44-yard score and threw a 1-yard TD pass to Julio Jones in the back of the end zone. Ridley had three catches for 90 yards and Sanu had five grabs for 81 yards for the Falcons (6-9). Brian Hill had 115 yards on eight carries. The Falcons intercepted Taylor Heinicke three times and forced four turnovers after allowing a touchdown on the game's opening possession. Heinicke, making his first NFL start for the injured Cam Newton, left briefly in the second quarter with a left elbow injury, but returned and was hit repeatedly by the Falcons. Christian McCaffrey had 21 rushes for 101 yards and 12 receptions for 77 yards for Carolina (6-9) and set an NFL record for receptions in a season (106) by a running back.